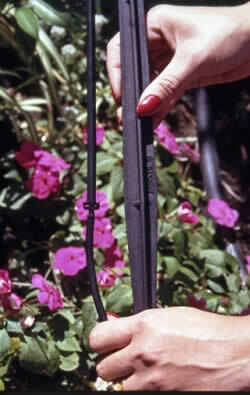 The easiest installations are single irrigation lines attached to a tap, with the pipe connecting the sprinklers laid above ground. 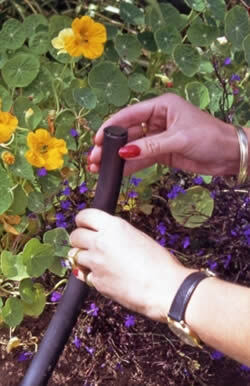 The pipe is attached to a garden tap. The sprinklers are attached to vertical supports, which are available in various heights. The supports are simply pushed into the soil. A mini computer can be installed at the tap – this turns the water flow on and off at preset times. Such a system is quite sufficient for a small townhouse garden. The most complex is an irrigation system with multiple irrigation zones operating through an automatic controller attached to the water mains. 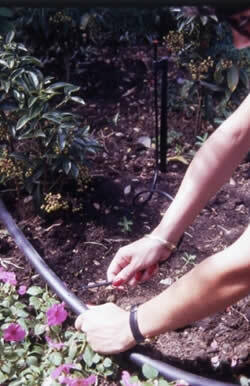 A comprehensive garden irrigation system consists of a controller, valves, pipes, fittings and sprinklers. You need to be a good home handyman to install such a system. 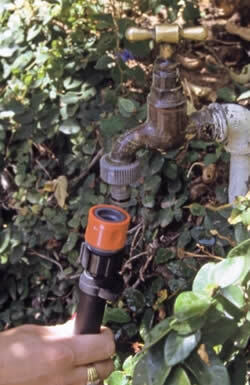 It needs careful planning beforehand and a knowledge of available water pressure. As there is seldom enough water pressure to be able to irrigate an entire garden at one time, the irrigation system has to be divided into different zones which will be watered at different times. The size of your garden will dictate how many zones, and what equipment, you will need. Try to use the same amount of water per zone. 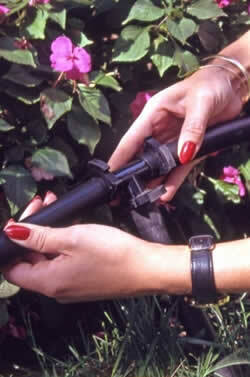 Within each zone, use only one sprinkler size (radius of spray) and type (pop-ups, shrub sprayers). However, different spray configurations (degree of spray) can be used. It's best if all the components of a system are manufactured by the same company in order to ensure that they are designed to work well together. 1. 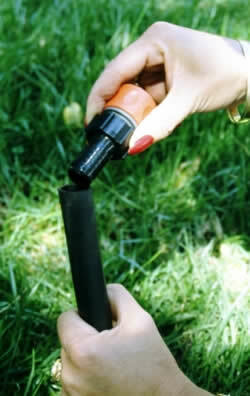 Use a sprinkler head with the right pattern for the area that you wish to irrigate. 2. 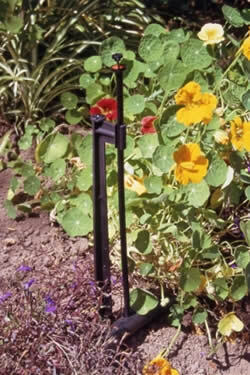 Attach the sprinkler head to a stand. 3. 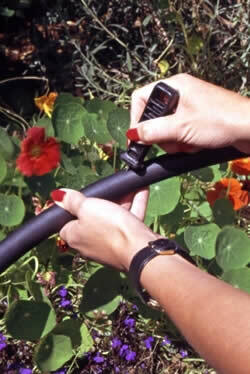 If the sprinkler head is close to a large poly-pipe, directly attach the flexible tubing. 4. 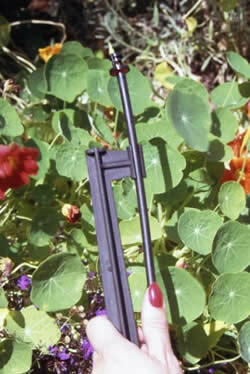 If the stand lies some distance from the poly-pipe, add additional small diameter flexible tubing. 5. Punch a hole into the large diameter poly-pipe. 6. 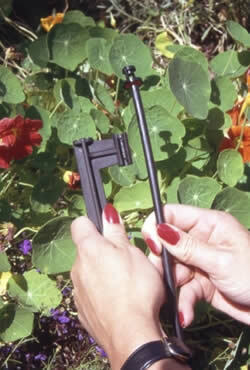 Insert a barbed adaptor at the end of the flexible tubing into the poly-pipe. 7. Use a T-piece if the poly-pipe needs to change direction at a sharp angle. 8. Flush out the entire system, before pushing end caps into both ends of the poly-pipe. 9. Insert a quick-snap connector into the poly-pipe. 10. Connect your poly-pipe to the tap. 11. 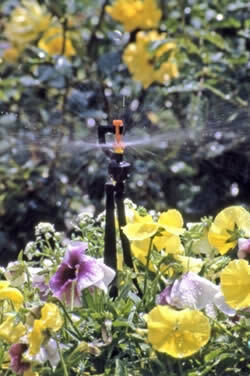 Micromist irrigation creates a humid micro-climate in flowerbeds.